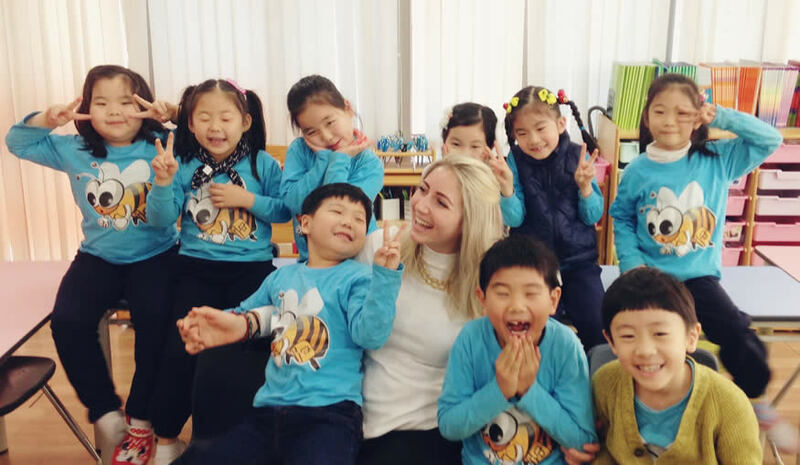 Watch the video below to see our TESOL/TESL/TEFL grad, Emily, answer your questions about teaching English in Korea, including salary, traveling abroad, & what teaching ESL is like. 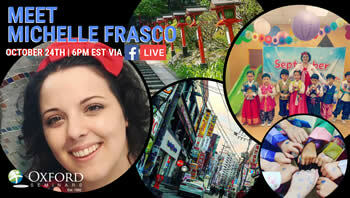 Want to learn more about teaching English in Korea and other exciting destinations? Attend a Free Information Session near you! Q: When did you graduate college and how did you decide that you wanted to take this adventure teaching English abroad? A: I graduated college in 2014, and I graduated with a degree in retail merchandising and product development, but I decided that I didn’t want to go that route. I didn’t really click with the fashion world. I wasn’t feeling that. So I graduated and I didn’t know what to do with my life. And I like to travel. I like to try new things and things like that, so a friend of mine suggested I look into teaching English abroad. So I did and it was basically everything I wanted to do. It was work, travel, creating a life for yourself. It’s like an actual job. It’s super awesome to do right after college. So I got involved. I looked into where to get my certification because I was not actually an English major or an Education major. So I got my TEFL certification with Oxford Seminars. A few months after I graduated from my course with Oxford, the recruiters help you to get a job, and they placed me in a school in South Korea, which was my first choice actually. I was really excited about living in South Korea. I thought it sounded like an amazing place: there were free benefits for new teachers, and so I got that going. Q: What can you expect from an average day teaching abroad? 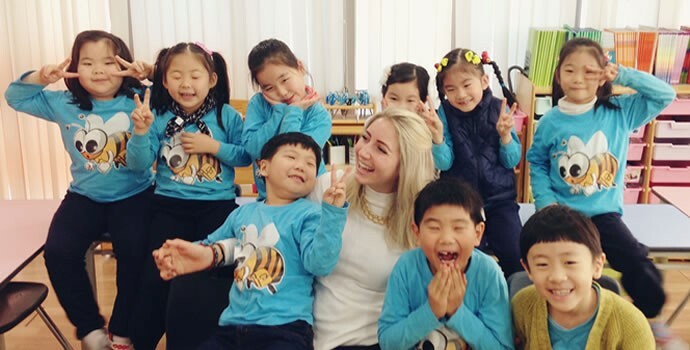 What was your average day like teaching English in Korea? A: Well, it was pretty much as if you were in an American classroom. You get to school, have a snack with the kids, do a few lessons, have lunch, do playground lessons. For the beginning of the day I was with the same group of children. There were 12 of them and it was run just like an American classroom would be, basically. It was full immersion so it was phonics, math, art; I was their teacher for everything. And then at 3:00 pm, they would go home, and I would start teaching older children that were in elementary school during the day and would come for a shorter English lesson in the evening. So after I was done with them it would be around 5:00 or 6:00 pm and my day was over. Q: So tell us about…how you felt when you actually got on the plane to leave to go teach English abroad. What was that like? A: Somebody asked me last night, “what was your biggest challenge?” and my biggest challenge was just getting there because it’s so terrifying not knowing what’s going to happen. I didn’t know anybody living in South Korea. I didn’t know who was going to pick me up from the airport… but once I arrived, my nerves disappeared. It was so normal and so easygoing…It was so easy once you arrived. Immediately, I was at ease and I was like “Okay, I can live here. This is amazing.” It was really cool. Q: Were your interviews done through Skype, by phone, or in person? A: They were always by Skype. Sometimes it would be with video and sometimes it would be just audio, but the schools usually want to see you and chat with you on Skype. Q: What was it like in the first week or two, when you first got to South Korea and you didn’t know anybody? A: The first week was really terrifying, I guess, because it was a brand new school opening up, so I was one of the first foreign teachers to get there. It was really small… A week later, another teacher got hired. Two weeks later, two more teachers got hired, and it started growing, our little staff started growing. It was so good after that. Everyone started hanging out, we all made friends with each other. It was really easy once some other teachers got there and we got it all together. Q: What was the food like? A: The food was incredible! I’m sure everyone I’m friends with now is sick of me because all I want to do is eat Korean food, because it’s amazing. It’s great quality food, it’s spicy, it has everything in it, and it’s so cheap! You can have a full meal, a really, really nice full meal for like $5 US. Q: Was it hard to adjust to living in a foreign country once you got there? You were there for two years, right? A: Yeah, I was there for two years. At first, I thought it was going to be crazy culture shock or something like that. It was not that much of an adjustment actually. It was like living in any city. You walked to the grocery store to get your stuff. You have your own flat. It wasn’t really a huge culture shock or a hard adjustment really. Q: Did you have any problems missing your family or friends back home? A: Yeah, I did miss my family and friends, especially with the time difference. It’s really hard to talk to people at home because either it’s really early in the morning for you or really late at night for them. It’s hard to get on the same schedule to talk to them. So that was a bit difficult but the whole adjustment to the culture wasn’t bad, even the fact that they spoke a different language. You learn a few words and you’re good to go. And they love foreigners there. They’re not going to be like “No, I’m not going to help you.” They love to help you. They want to be your friend; they want to get you on Facebook. They’re going to help you with anything. You gain so many support systems once you arrive. Q: What was it like on the weekends for you? A: The weekends are amazing. You have so much stuff to do. I was living in Seoul, so I was in the capital, and it’s a huge city and really, really nice. You can do anything you want on the weekends. You can go ride bikes, you can go visit a traditional village, you can go to Gangnam, which is like New York, you can go out. There are a million options. You’re never bored. Q: Well, I was following you on Instagram and I saw that you took weekends and you jet-setted to different places. Did you go to Japan and a couple other vacations? A: I did, I did. For the weekends, it’s hard to do a trip like that, so it would be more for little holidays you get like three-day weekends here and there, and then you can easily book a trip. Japan is like an hour or two hour flight away so that’s really easy to do. On long weekends, I would also like to just travel within South Korea: Go down to the south, go to Busan, and go to some of the surrounding islands. It’s cool to see that because in Seoul it’s just a big city, and then you go outside a little bit, you go south four hours and you’re going back in time. It’s all traditional houses, it’s really different. And that’s when you don’t see a lot of foreigners and they want to talk to you and interact with you. It’s just so cool. Q: So now you’re in Australia and you’re thinking about teaching English abroad for another year? A: Yeah, I am. I’m looking into jobs right now. So I have an offer in Vietnam and China, so I’m deciding what I want to be doing in the next few weeks and if I want to take those jobs. I’m strongly considering going back to Vietnam because after I finished my contract in South Korea I traveled. I backpacked for three months throughout South East Asia, and Vietnam was amazing. We almost overstayed our Visa. We didn’t want to leave the country. I definitely want to go back there. And teaching there is pretty good also, so I was thinking that would be a good idea. Q: What were the living conditions like when you were living in South Korea? Do you have an apartment? Do you share? Do you have roommates? How does that work? A: I had an amazing living situation and I have talked to other teachers and seen other teachers’ places and I know I was really lucky. I was in an amazing spot. I was in a little neighborhood just outside the main part of Seoul, and I had a flat to myself. It was just a studio apartment, just a square, but it was really big. I had my own washing machine, I had a shower, I had a queen size bed, I had dishes and everything provided for me, I had a heated floor. It was a really nice apartment. I’ve seen other situations where teachers get to an apartment and it’s like a third of that size and it doesn’t have all these things. It depends on your school and it depends on what kind of place you’re working in. But if I have advice for anybody, you can ask a current teacher at the school if you’re considering working there. You can have them send you pictures of their apartment because, most likely, you’re going to be in the exact same thing. So if you are looking into getting a job and trying to work that out, ask for a teacher’s email and just chat with them a little bit. Q: What is something you wish you knew before you started your first job? So you said taking a picture of the apartment. Any other advice for first-time teachers that you wish you knew when you started? A: I would just tell somebody to not be so nervous about it. I was really, really nervous about getting on the plane and going, so if I had any advice it would be: just do it, and it’s okay. You’re going to be fine… There’s nothing I can say like “make sure you do this” because you can’t. You have to go experience it and embrace it, and depending on what country you go to it’s going to be completely different. But I would just say, just get there and don’t be afraid. So many people are doing this now; it’s not anything to be that shaken up about. Q: Did you feel safe while you were there? A: Yes, really safe. Walking down the streets at home [in the U.S.] at night, I wouldn’t feel safe. In South Korea, I would be by myself at night, in the middle of the night, in random neighborhoods here and there. I would never feel threatened or scared at all. It’s such a safe place. The crime rate is extremely low actually. It’s no problem. Q: You were talking earlier about your classroom and what it was like… you shared some other details… about the type of class you were teaching, and the kids in your class, and how you were first communicating with them. What was that like? A: With my first year students, I had a really small class and they were awesome. I didn’t have them for the full year. My second year students were all six years old, six, turning seven, so they were kindergarten age and they were beginners. They didn’t speak a word of English. They couldn’t right their names. They were really, really beginners. So in the beginning we’d communicate by doing charades, basically, because we couldn’t understand each other. But it was incredible because, as the year went on, we developed such a good relationship and by the end they were writing stories, reading books, taking quizzes, speaking in full sentences. We’d chat about anything and it was so cool to see that growth. And even though in the beginning we couldn’t speak with each other, we got along so well. I loved them from the get go. They were such a good group of students and they were really enthusiastic. And I imagine it’s quite hard for them. Imagine a teacher just coming to you and talking to you in a different language all day long. That’s exhausting and I’m so proud of them for dealing with that. Q: Did you pick the type of class you wanted or did they match you? Did you say you wanted to teach younger children? A: For most schools in South Korea, if you’re a first-time teacher, you’re going to be teaching kindergarten age. That’s a really popular thing in South Korea is having a private school for kindergarten mostly during the day and an afternoon teaching slightly older elementary students. So in South Korea you can expect to be teaching younger students. As for the level of my class, I didn’t choose that. They matched me with those students and that was that. I honestly prefer it though. Some of my friends were teaching second or third year students that had been there for a little bit, and I just loved my kids so much. I love that we bonded so much. And that you can see: they started from zero and they became amazing English speakers. It was just such a cool process to see. Q: So what if somebody’s on the fence and they’re procrastinating enrolling just to even do the course. Is there any fear factor that should be holding them back or should they worry about anything about the actual certification process? A: No way! It’s actually so good to do the process of it all because it eases your worries a bit, in the in-class portion you actually mock teach, do a mock lesson, so it kind of gets your confidence up speaking in front of people and getting that going. Also, once you finish the course you can tell them what country you’re interested in, you can tell them three countries if you like, you can tell them one, doesn’t matter. They’re going to set you up with recruiters in those countries and you’re going to be able to interview with schools. Even if you don’t want to take the job, just interview with the school and then see what they have to offer. So enrolling in a course is going to set you up with a million options. Q: How do you think this is going to impact your resume and job opportunities beyond teaching English abroad? A: Oh I think it’s definitely going to positively impact my resume and things like that because it’s a professional job. It’s an actual job. You’ve committed to a contract. 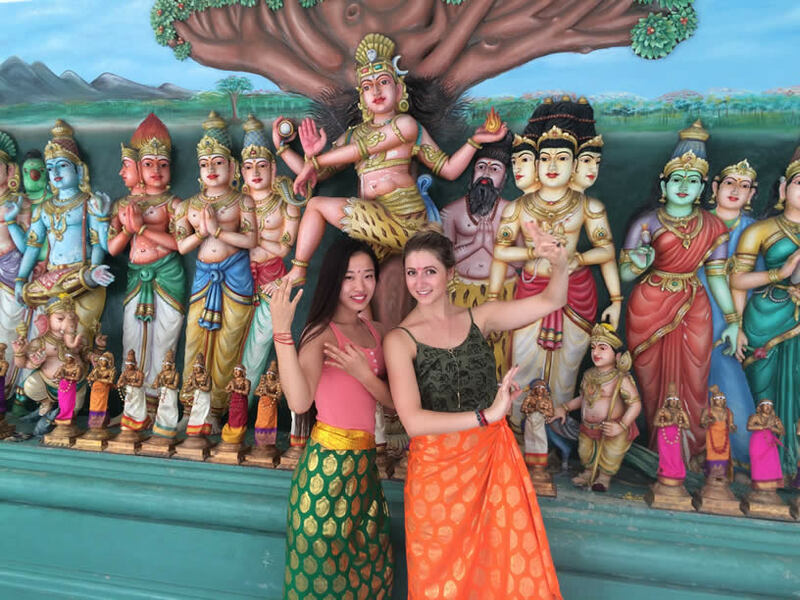 You have so much experience traveling and working abroad. It shows a lot of different characteristics of your personality. Employers really like that. And if you want to continue teaching or go back to school or something, it looks so good to have that year. Q: When you signed up did you think you were going to do two or three years? What did you think you were going to do? A: I was going to do a year… I fell in love with my job and my life there. I was like “Okay. I’m staying another year!” Even when my second year ended I was crying my eyes out. I didn’t want to leave. Honestly, I would go back to South Korea if I could. Maybe later in life once I’ve experienced more things, I could easily live there permanently. And that job and my lifestyle; it was just so amazing. So a year is not enough. I needed two. Q: Would it be safe to consider teaching abroad as a lifelong career? A: I think so, yeah. A lot of people do it, actually. Someone at my school, he was maybe 30-something, and he had been there for seven years or something like that, and had no plans to leave. The longer you stay, they increase your salary every year that you stay there, and the more experience you have the more they increase it… You can be making as much as you’d be making in the States but it’s so easy to save. Q: That was going to be my next question, was it easy to save money? A: Oh yeah! I saved lots of money there. It was really cheap cost of living. The school pays for your apartment so you’re not spending money on that. You walk to work everyday. You’re not spending money on a car or anything like that. The food is pretty cheap. I was basically saving half of my paycheck every month and putting that away. And now it’s been like six months where I haven’t been working. I’ve just been traveling using my savings that I’ve made from that. I need to start finding a job now but I’ve had six months of solid travel that I’ve got out of it. Q: Is it only [for] young people? What about people 50 and older? A: One guy at my school was a bit older. He was, I think, like 49 or 50 and he had been doing it for a really long time, so he was an example that it’s not all young people [teaching English abroad]. The majority is, for sure. It’s people doing a gap year, or people like me. I didn’t know what I wanted to do right after college, but it’s definitely possible to if you’re older than 50. Q: Where do you see yourself in five years with all this knowledge and life experience you have? A: Hopefully still traveling. I don’t really plan to settle down yet. I want to keep teaching and working, and traveling and doing things like this. But we’ll see. Honestly I don’t know. I could go back to school, I could keep teaching. It’s kind of up in the air, but hopefully still out and about and traveling. Q: What is the typical salary and what was the length of your teaching position? A: Typically, in South Korea you’re making $2000 US a month, but it’s plenty because you’re not paying for your apartment, you’re not paying for your plane ticket. So it sounds like not a lot but actually, when you factor in the cost of living, it’s great. Typically, they’ll do a contract for a year. Some schools want more and they’ll offer you more money if you agree to more, sometimes. But yeah, typically it’s about a year. Ready to start your adventure teaching English in Korea, and many other great ESL teaching destinations?